Proposition 31 is an example of bad government. California voters will get to vote on this measure soon. It's on our November ballot. Bad as it is, this initiative measure is touted as "good government." It's a "reform" measure, or so proponents claim. The leading proponent, by the way, is a Southern California billionaire, Nicholas Berggruen, but Santa Cruz County folks should know that there is a "local angle," too. Proposition 31 was submitted to the Secretary of State by Bruce McPherson, formerly a statewide Republican Party leader who is now running for the Fifth District seat on the Santa Cruz County Board of Supervisors (the San Lorenzo Valley and Scotts Valley seat). After I highlighted Mr. McPherson's sponsorship of Proposition 31, Mr. McPherson promptly withdrew as a sponsor of the measure, and quit the Board of Directors of California Forward, the group that thought this measure up. Incidentally, this pattern of conduct does not seem to be unusual for Mr. McPherson. Having been a member of the Republican Party his entire adult life, and having served as both a Republican Assembly Member and a Republican State Senator, and as a statewide Republican Party official in state office, Mr. McPherson has now repudiated his Republican Party past. This switch in allegiance occurred right after Mr. McPherson did NOT win the Fifth District Supervisorial seat in the primary election in June. Up until then, McPherson was a statewide Republican Party leader. Now, he is an apostle of non-partisanship. My bet: he's voting for Mitt Romney for President. 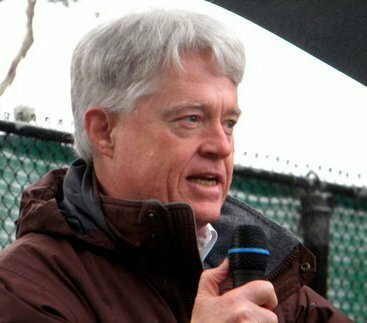 Bruce McPherson is not the only local politician with ties to Proposition 31. Santa Cruz County Treasurer Fred Keeley served on the California Forward Board of Directors with Mr. McPherson. Unlike Mr. McPherson, however, Mr. Keeley has not quit that Board. I am happy to report, though, that Mr. Keeley has announced that he will not be supporting Proposition 31. So, what is so bad about Proposition 31? 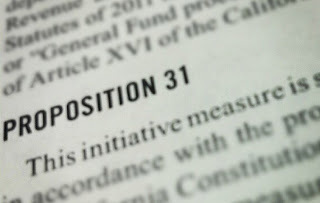 Proposition 31 proposes an amendment to the California Constitution. If enacted, Proposition 31 would fundamentally change our system of government, by allowing local government agencies to "nullify" state laws with which they disagree. Specifically, if Proposition 31 passes (click the link for the full text), local governments will be able to enact a "Community Strategic Action Plan" (see proposed Article XI), and having done so, can then nullify state regulations that the local government determines might impede their plan, as long as the local government claims that it has a "functional equivalent" to the superseded regulations. As a practical matter, this means that local governments will be able to shortcut laws and regulations protecting the natural environment, including the Coastal Act, CEQA, and the state's air quality and water quality laws. Proposition 31 is an example of "bad" government, because it pretends to do one thing, while actually doing something else. Environmental groups, like the Sierra Club, are doing everything they can to get the word out, but they don't have any billionaires on their side. Unless voters really pay attention to what Proposition 31 will do, its "reform" label may convince voters to cast a "Yes" vote. The last statewide Constitutional initiative that is somewhat equivalent to Proposition 31 was Proposition 13 (just "flip" the numbers: 13 to 31). Proposition 13, too, seemed imbued with a "reform" purpose, and was adopted as a "reform" measure in June 1978. In fact, Proposition 13 led to a wholesale change in state government, and we are still suffering with that one! Let's hope that the voters can penetrate the packaging on this year's leading "bad government" measure. If they don't, the California environment is going to be facing even more (and very serious) trouble.